Note: Keep in mind, the narrative below was written before the violent fraudulent eviction of Feb. 2, 2010. 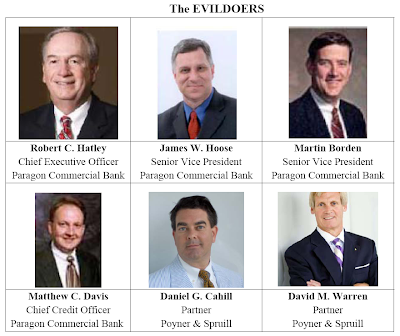 Reflected below are the “Mug Shots” of those responsible for committing the last, and most reprehensible phase of the Worst Bank Foreclosure Fraud in U.S. History, encompassing a range of CRIMINAL acts against Spencer C. Young, his family and friends, his affiliated companies, and the communities in which he and his family reside, and in which he has invested. 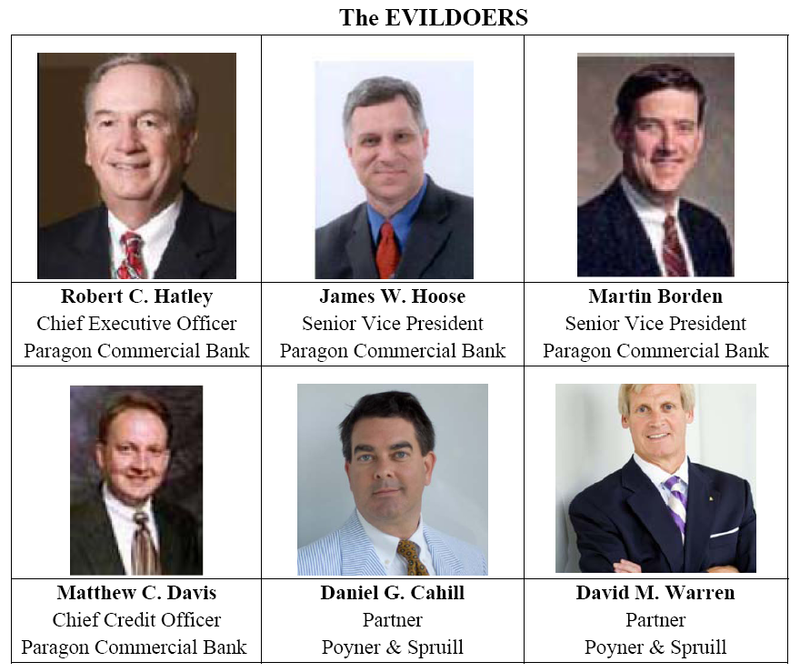 The person leading this detestable assemblage of evildoers is Bob Hatley, CEO of Paragon Commercial Bank. This is an especially heartless group, devoid of any sense of humanity – in short, they are MONSTERS. They have directly engaged in, or otherwise been complicit to CRIMINAL activities, including: Fraud, Racketeering, Extortion, Sabotage, Corruption and Assassination, both attempted (against Mr. Young) and realized (against his wife of 24 years). 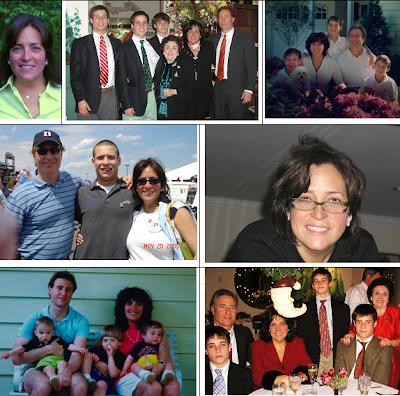 Their malicious and aggressive actions are intended to bring unimaginable pain and suffering to Mr. Young and those in his extended family who have long depended on Mr. Young for financial support – and because their actions were knowingly undertaken to cause the death of certain family members – they are MONSTERS and they are as EVIL as EVIL can be. Reflected below are photomontages of just some of the victims, along with brief contextual background summaries on each. They are all kind, innocent and GOOD people -- ergo, this matter couldn’t be a more clear-cut instance of . 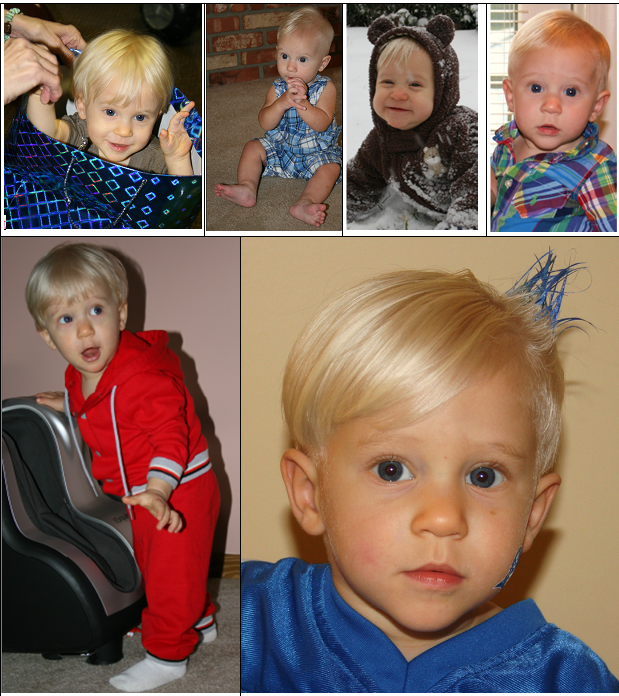 . .
Jackson Young – The first of the GOOD people being persecuted in this matter is Mr. Young’s youngest son, Jackson Young (born in April 2008), whom Mr. Young often cares for, when Jackson’s mother (Mr. Young’s fiancée) is away on business (she is a flight attendant). Through FRAUD, the Evildoers are aggressively trying to evict and render homeless this GOOD little boy – moreover, they have plans in place to orphan “Jack”, so that Mr. Young will be forever silenced, thereby covering up widespread criminal activities that Mr. Young is blowing the whistle on. 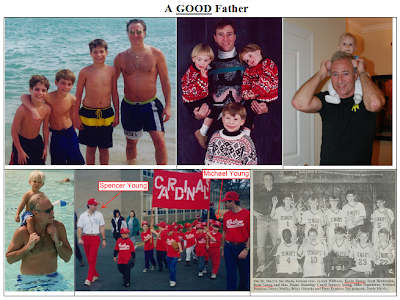 Relationship with Sons – In addition to little “Jack”, Mr. Young has three older sons, Michael Young (born in 1986), and fraternal twins Kevin & Ryan Young (born in 1989). 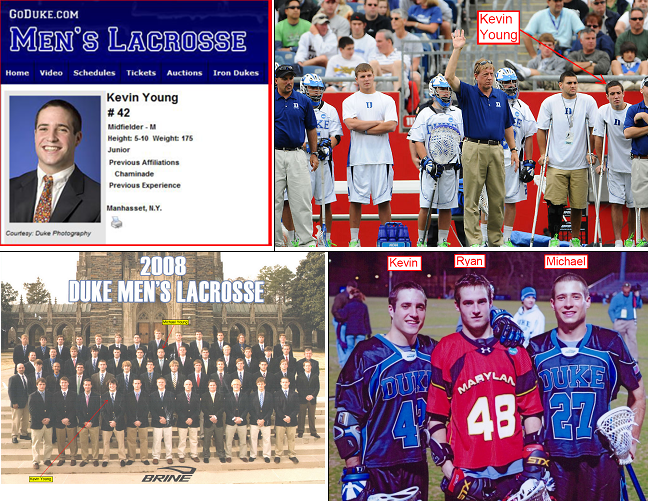 Throughout their childhood, Mr. Young was actively involved in their lives – he coached virtually every one of their sport teams, and arranged his vacations so he could take them to summer lacrosse camps, and serve as a counselor. So it should come as no surprise that they all played lacrosse for two of the top colleges, one played in three NCAA Final Four Championships and one became an All-American. Mr. Young deeply loves each of his sons – they are GOOD kids. And it pains him terribly that his relationship with his older sons has become effectively estranged. This is because they have heretofore been unable to comprehend how their father, who regularly had a seven-figure annual income while they were growing up, could so suddenly be unable to provide for them financially. By FRAUDULENTLY depriving Mr. Young’s of income from his commercial properties, the Evildoers committed grand larceny theft, thereby causing unimaginable pain and suffering and extensive damages to Mr. Young and his extended family whom have long relied on him for financial support. Maria Young – Maria was married to Mr. Young for 24 years – she too is a GOOD person. Without question, their marriage would have endured for the remainder of their lives had it not been subjected to the unimaginable and unrelenting stress of the FRESCA crimes, the “coup de grace” phase of which is being executed by the Evildoers. The objectives of the Evildoers' CRIMINAL ACTIVITIES were to: (1) deny Maria necessary chemotherapy and radiation treatments for her advanced pancreatic cancer; (2) render Maria and her three sons homeless; and (3) make it appear that Mr. Young abandoned them. In effect, this is a Machiavellian recipe for MURDER and the vicious decimation of a once close and loving family. Leah Krier – Leah is Mr. Young’s fiancée – she is a GOOD person from a large family in Kansas. Her marriage to Mr. Young was delayed by the fraud, which sullied his sterling personal credit rating – and their marriage will continue in abeyance until this is cleared up. 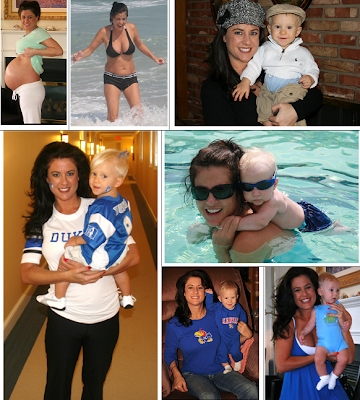 Leah gave birth to Mr. Young’s fourth son, Jackson in April 2008, and balances her career as a US Air Flight Attendant and caring for “Jack”. Through their CRIMINAL FRAUD, the Evildoers are aggressively trying to render Leah and llittle Jackson, homeless. 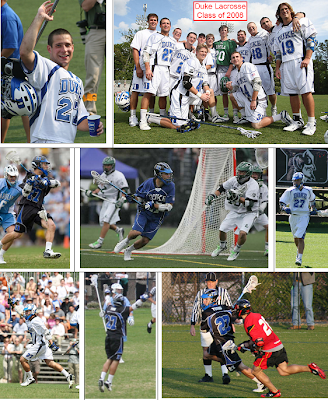 Michael Young – Michael graduated with honors from Duke University in May 2008, and played for the Duke Men’s Lacrosse Team – He’s a GOOD young man. He was consistently selected to the ACC Academic Honor Roll and was a consummate unselfish player on a team that went to the NCAA Final Four Championships in 3 of the 4 years he played. He now works for Lazard, one of the world’s top financial advisory and asset management firms. It is Michael’s income that thwarted the Evildoers’ attempt to render Michael’s mother, who is stricken with cancer, homeless. 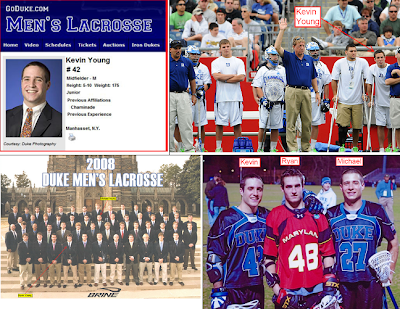 Ryan Young – Ryan is a natural leader and a standout in lacrosse, evidenced by his: (1) selection as a 1st Team High School All-American; (2) ranking as the 7th best player in the nation entering college; (3) gold medal for Team Long Island in Empire Games; (4) gold medal for Team USA in the World Games; (5) running University of Maryland’s offense since day one as a freshman, an remarkable feat; (6) selection as an NCAA All-American as a sophomore; and (7) appearance on the covers of Lacrosse Magazine and the Inside Lacrosse 2010 Yearbook. He is a GOOD young man. Through their CRIMINAL ACTS, the Evildoers want Ryan to drop out of college, and homeless. 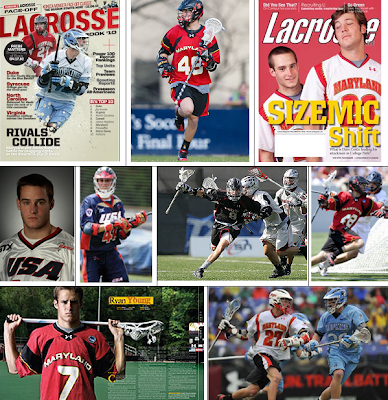 Note: Ryan wore #48 as a freshman and #27 as a sophomore for Maryland, # 8 in the Under Armor All-Star Game, #44 for Team USA in the World Games and #7 for an article on the Top 10 players. Kevin Young – Much like his brothers, Kevin achieved significant success in high school. He was a honors student at Chaminade H.S., as he led his varsity lacrosse squad to a two year record of 35 wins and only 6 losses, achieving the league title each year, and receiving All-League and “Midfielder of the Year” honors. He is an exceptionally unselfish player who also led his JV and Freshman lacrosse teams to league titles and in the two years that he played football (he was captain) his squad was league champion each year. Kevin is a “winner” and quietly leads by example. As a member of the Duke Men’s Lacrosse Team, similar success during his first two years has been hampered by a nagging ankle injury. Once healthy though, Kevin is expected to realize much the same success in college as his brothers – in fact, he is stronger and faster than both Michael and Ryan – pound-for-pound, he may be the strongest player in college lacrosse, and he possesses world-class speed. Through their CRIMINAL FRAUD, the Evildoers aggressively sought to force Kevin to drop out of Duke University and render him homeless. Edna May Young – Mr. Young’s mother has depended on him for financial support since her husband (Mr. Young’s father) passed away in 1986. Once a vibrant and energetic fashion model, Edna May is now elderly (born in 1926), and has a heart condition. She is absolutely devastated and distraught that Mr. Young is now unable to provide her the financial support she has depended upon for over 30 years, and which she now so desperately needs. She is a GOOD and kind woman. The Evildoers were fully aware of this situation, as this information was shared with them on MANY occasions. Therefore in undertaking their CRIMINAL FRAUD, it was their deliberate and decidedly evil intent to create a level of distress that would end up killing Mr. Young’s mother – this is yet another of the Evildoer’s Machiavellian plans to carry out a surreptitious premeditated MURDER. Thankfully, Mr. Young’s brother-in-law is a physician, and together with Mr. Young’s sister, Denise, have thwarted the Evildoers’ murderous plans for Mr. Young’s mother. 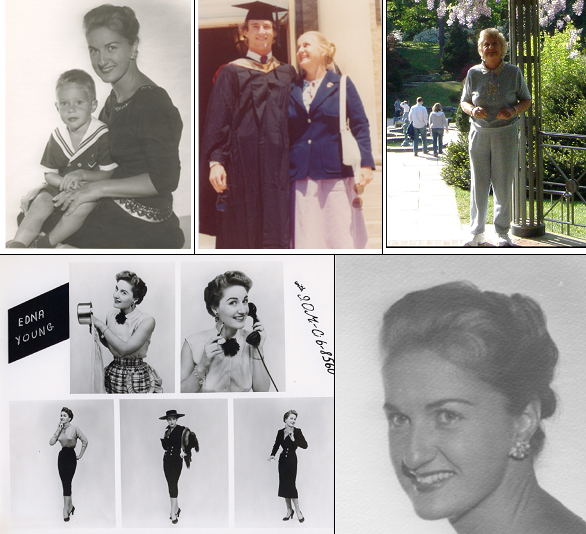 Note: the above pictures of Mr. Young’s mother are circa 1955 through 2005. Spencer Young – Mr. Young is a GOOD man. He was born in 1956, and the below pictures are circa June 2007 through October 2009. He maintains his “temple” of 6’ 2” & 195 lbs. 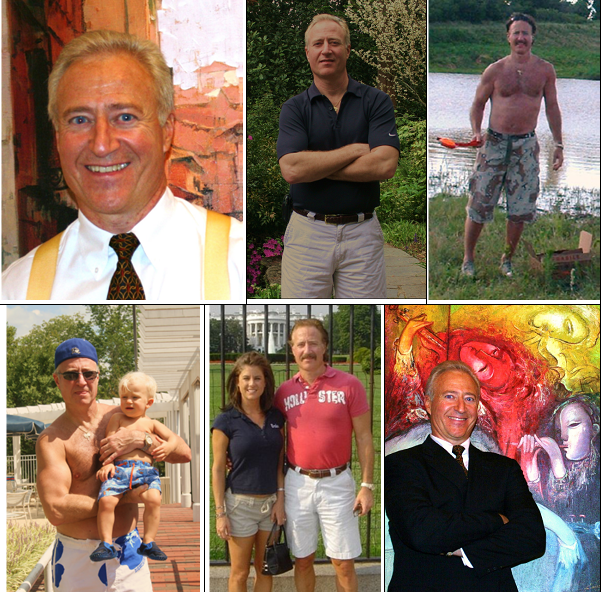 from when he played football for Cornell University through rigorous exercise and practice of martial arts (Tae Kwon Do, Shotokan & Kyushojutsu) over the past 30 years. This has provided him with a high energy level, an introspective sense of confidence and unwavering focus that many find astonishing – but these are absolute imperatives in order to prevail in his quest for truth and justice. And toward this end, he is focused on exposing and extricating the Evildoers from their respective positions of authority, so they can no longer be in a position to inflict malicious harm to others. Mr. Young will NEVER give up on this pursuit – for its importance cannot be overstated.